Being a truck driver is like being a professional athlete: both follow strict regulations, need a good support team, and require commitment to succeed. Truck driving is a lifestyle; ask Steven Cohen. He will tell you his dedication to the trucking industry is the reason behind his successful business as an independent contractor. Hard work pays off. Once Steven sets a goal, there is no stopping him. He even chooses to forgo his hometime for months at a time, preferring to focus on his goals as a truck driver. Steven has a drive to succeed and his success as an independent contractor recently allowed him to purchase his first truck. Steven was fresh out of truck driving school and brand new to the trucking industry when he started as a company driver with TransAm Trucking in late 2014. When asked, Steven will tell you he is very grateful for his time as a company driver. It gave him a chance to learn the industry at his own pace, gaining the confidence to eventually branch out on his own and start his own business. 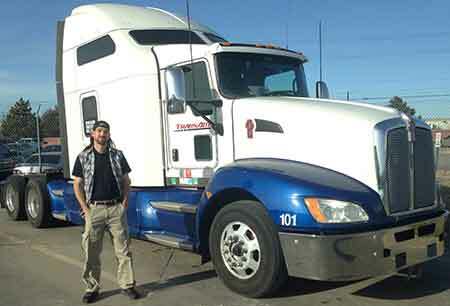 Spending 8 months as a company driver learning TransAm Trucking’s routes and policies allowed Steven the freedom to make a smooth transition when he decided to become an independent contractor with TransAm Trucking. He understands the ebbs and flows of his business. When asked about his growth as a truck driver, Steven says it is important to take things one step at a time. Do not rush into anything and take time to learn the industry. “Nothing is going to happen overnight.” Steven attributes this philosophy, combined with a positive relationship with his Driver Manager, to his success. A positive attitude is an essential tool. Steven emphasizes the necessity of trucking being a team effort. From the planner to driver manager to truck driver to shipper, it is vital for everyone to cooperate and remember each person is working hard to ensure the load delivers on time. Things will not go smoothly all the time. It’s part of his business, and Steven says it’s imperative to not let setbacks affect your attitude. A good attitude can take you a long way.